Maybe we all just need a nap. I have been in the midst of an epic book slump the past few weeks. I’ve been reading as much as always, but I haven’t been finding the enjoyment I usually do. It’s not that every book I’ve picked up has been a dud, but none have quite risen above adequate. And when it comes to my reading (and especially my reviewing), I’m looking for better than adequate! So in order to keep the blog from collecting too much dust, I’m here with some tips and tricks for beating a book slump. These are things I’ve tried recently, with varying degrees of success, to kickstart my reading life back into high gear. If you’re in the same book slumping boat, maybe some of these tips will help you right your ship. I read across lots of genres like a happily pollinating honeybee, but sometimes I get locked into one kind of book without realizing it, which can make my reading life feel a little stale. Too much of a good thing really can turn into a bad thing! For me, it’s all about finding a good balance. I am not a big rereader, but occasionally I will start a series before all the books have been published, and then I have to go back and reread the earlier books before reading the latest installment. This works best when I’m really invested in the characters and am dying to know what happens to them. I’m currently in the middle of rereading a trilogy I started last winter (review coming soon! ), and I can’t wait to see how the third book wraps everything up. Don’t be afraid to DNF. If you’ve been stuck on the same book for weeks and find yourself fabricating excuses (like housework) to avoid picking it up, it’s probably time to send that puppy packing. It doesn’t have to be permanent—maybe someday it’ll be exactly what you’re in the mood for. But if your kitchen floor is spotless and your book’s dust jacket is living up to its name, there’s no shame in moving on. If you keep putting yourself out there, eventually you’re bound to get lucky. Maybe you need some space. 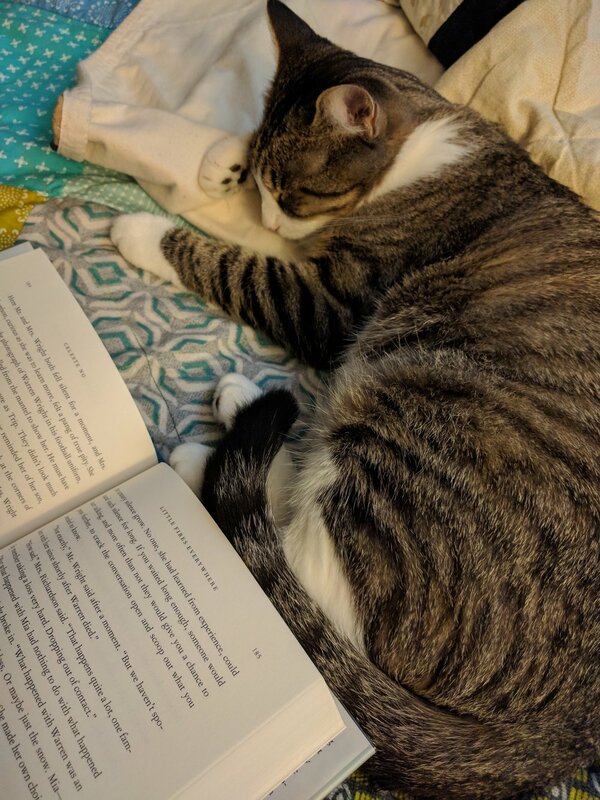 If your book slump has gotten really serious, it might be time to take a break completely. Maybe it would be more relaxing to spend your reading time doing yoga, streaming Travel Man on Hulu (the go-to at our house), making a homemade meal, or bonding with your favorite people. If your book slump is causing you angst, it’s not worth forcing it. Give yourself a break and you’ll come back better than ever. The only good thing about book slumps is that they don’t last forever. My reading life has picked up in the past couple days, and I think I’m well on my way to recapturing the magic. I’ll be back soon with more fabulous recommendations for you!